In the late 1990’s I picked up a pocket paperback at a garage sale. Published in 1994, the book became one of the most memorable books I’ve ever read. It follows the life of Lady Alice, a British woman living in the 1940’s who married an Egyptian Muslim, Dr. Ibrahim Rasheed, and moved into his family’s home. She, and the daughter she later had, were greatly impacted by a culture foreign to the west. The practices of her mother-in-law, sisters-in-law and nieces sometimes shocked her as she struggled to protect her daughter from becoming like them. After reading The Kite Runner and A Thousand Splendid Suns, by Khaled Hosseini, my memory of Virgins of Paradise Street returned full force and I wanted to read it again. Thinking an old copy might turn up on Half.com, I went looking for it. It turns out Barbara Wood republished the book as Virgins of Paradise in 2007. It was that copy which I acquired and re-read. She re-edited the book, adding, enhancing, and fleshing out the original version. Virgins of Paradise delves into the personalities and conflicts of several women, as well as the male Muslim doctor. You’ll find yourself empathizing with each of the women who, though very different, suffer under the same oppressive system. There’s also a mystery surrounding Amira, the doctor’s mother, that will keep you wondering as you read. Don’t let the title put you off. Virgins of Paradise is a fascinating and enlightening read. If you enjoyed The Kite Runner, you will certainly like this book. I think it is even better than either of Khaled Hosseini’s novels…possibly because it’s written from a woman’s perspective, but also because Woods successfully weaves several fascinating stories into one. 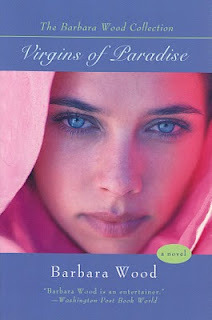 I highly recommend Virgins of Paradise by Barbara Wood.